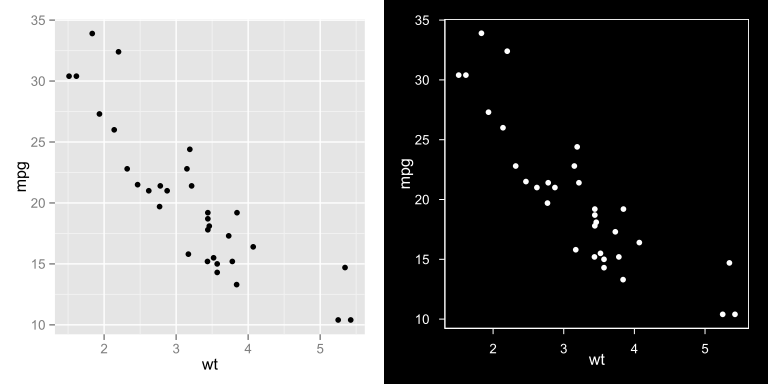 I’ve long extolled the virtues of using ggplot2 as a graphing tool for R for its versatility and huge feature set. One of my favorite aspects of ggplot2 is the ability to tweak every aspect of the plot using intuitive commands. With the recent release of version 0.9.2 though, creator Hadley Wickham overhauled the theme options, which broke my preferred black theme, theme_black(), found here. I’ve updated theme_black() to work with the current version of ggplot 0.9.3.1. Enjoy! Nice, thank you. Note that this requires the grid() package to use the unit() function. Right you are. Code updated! See updated post with link to gist…!